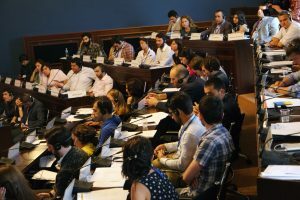 On 14-15 July, young politicians from across the political spectrum in the South Caucasus and Ukraine came together in Tbilisi, Georgia, to discuss digital tools and their potential to strengthen democracy. The event explored pioneering innovations in digital democracy and addressed the ways in which these new tools and technologies could improve the legitimacy of democratic structures and institutions through a combination of greater transparency, representation and better decision-making. 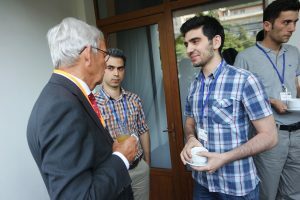 Speakers from political parties that use such technologies, tech firms, campaign managers, and political theorists presented their findings to the young and active participants from Georgia, Armenia, Azerbaijan and Ukraine. The participants: young and active politicians from South Caucasus and Ukraine. 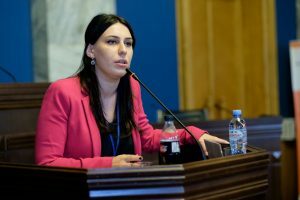 On the Forum’s first day, the young politicians focused on the challenges posed by anti-democratic propaganda that remains widespread in the South Caucasus and Ukraine. In a region that lacks strong democratic traditions, these developments can derail whatever democratic progress has been achieved. The participants shared their experience and strategies on tackling these challenges, and explored the role of digital tools in strengthening decision-making based on credible and verified information. The keynote speaker for this session was Eimert van Middelkoop, former member of the Dutch Senate and Minister of Defense of the Netherlands, who shared his experience and insight into the weaponization of information. During his speech, and in the lively debate that followed, Mr. Van Middelkoop discussed the possible effects of anti-democratic propoganda and fake news on democracy, and the nature of “truth” vs value-driven debate in politics. Engaged in dialogue: Mr Van Middelkoop gets to know the young politicians. A journalists’ perspective was delivered by Margarita Akhvlediani, Programme Director at Go Group Media. Placing her insights firmly in the local context, Ms Akhvlediani presented the subject of “disinformation in Eurasia”. Finally, the young politicians themselves took the floor to discuss how to tackle fake news and disinformation in their own countries and region during parallel working-group sessions. In these groups, the participants worked to set out a broad and regionally-shared vision on how to strengthen the knowledge and resilience among young politicians, their political parties and their countries as a whole. Young politician from Georgia, Mariam Kasrashvili, takes the floor. On day 2, the participants were invited to analyze the use of digital tools to engage citizens, and improve the quality and legitimacy of decision-making. Through this discussion, the Forum aimed to raise awareness among political parties and parliaments about potential benefits of adopting new methods, an awareness which may prove crucial in opening up the new process to greater citizen involvement, better decision-making, and more trust. NIMD’s Innovation Advisor, Will Derks, kicked off the session with his analysis of political parties in the digital age. Dr. Derks shared the importance of adapting to new tools and technologies within political parties to strengthen engagement with voters and remain relevant in a changing world. This was a message reinforced by the second speaker of the day, Alberto Fernandez of International IDEA, who focuses through his work on how technology can strengthen citizen’s ownership of democracy. While aware of the possible challenges associated with digital tools, Mr Fernandez gave valuable insight into their potential to close the so-called “representation gap” which causes lower voter turnout and decreasing political party membership. Alberto Fernandez addresses the young politicians. In the afternoon, the participants attended workshops on technology and political parties led by Socioneers, International IDEA and Elva. 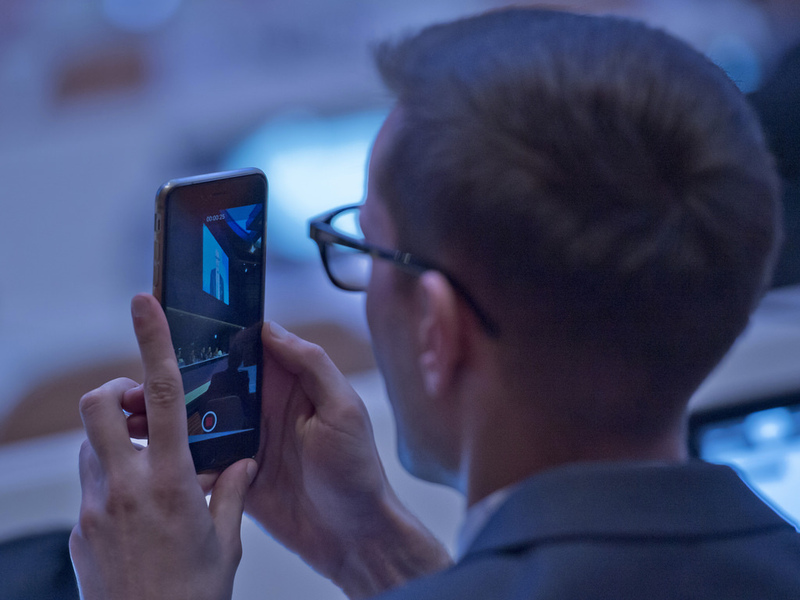 The three organisations provided practical and tailored advice intended to inspire the young politicians to consider how digital tools could help them in their work. 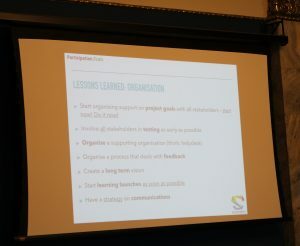 Top tips for using digital tools, by Raoul Kramers of Socioneers. The Digital Democracy Forum was closed by H.E. Johannes Douma, Ambassador of the Netherlands to Georgia, who praised the participants on their hard work and skills, and provided his analysis of the day’s discussions. Democracy is an ongoing and ever-evolving process in the South Caucasus and Ukraine. 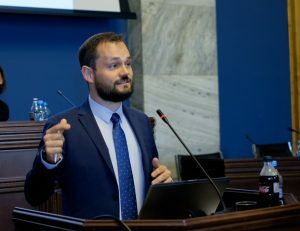 As the fifth in its series, the Forum of Young Politicians remains a critical platform for political and policy debate by the region’s future decision makers. In bringing together young politicians from across the region, the forum aims to in facilitate dialogue and experience sharing, as well as enhancing capacities of politicians for democratic action. The Forum was organized by NIMD’s Eastern European Neighbourhood office with support from the Conflict, Stability and Security Fund of the British Government.